Cassava peels could provide a readily available and sustainable source of animal feeds (photo credit: ILRI/Iheanacho Okike). 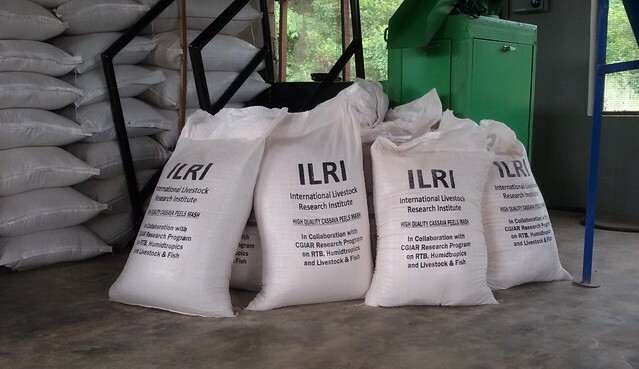 The International Livestock Research Institute (ILRI) recently promoted the use of cassava peels as animal feed to senior government officials from the Democratic Republic of Congo. According to an article in the Africa Science News website, the senior advisors in the office of the Prime Minister of DR Congo, John Ulimwengu and Kamwanga Masankisa, met with ILRI staff during a visit, in June 2015, to the International Institute of Tropical Agriculture (IITA) to explore areas of partnership with IITA and CGIAR. At the meeting, Iheanacho Okike, the ILRI Nigeria country program manager, said ILRI is promoting the use of cassava peels as feed for livestock with the aim of turning an environmental menace to a valuable commodity for animals. ‘This will save food for human consumption and reduce competition between livestock and human beings,’ said Okike. The meeting was part of DR Congo government efforts to transform its agricultural sector to increase food production and create job opportunities for its rapidly growing population. Read the whole story ‘DR Congo plots to transform her agriculture’ in Africa Science News. Tags: Cassava. Bookmark the permalink. My name is oluwaseun Adeyemi, I am a small scale cassava processor in osun state and interested in acquiring knowledge about processing casssava peels for livestock feed.